Imagine your entire life governed by a number. Imagine spending most of your entire life in an office waiting endlessly to change that number. Imagine that even when you see a specialist, there’s no guarantee that you’ll be able to change that number to a better one. In fact, a meeting might leave you with a worse one. No, it’s not your credit score (although that’s still important). It’s not your college grades. 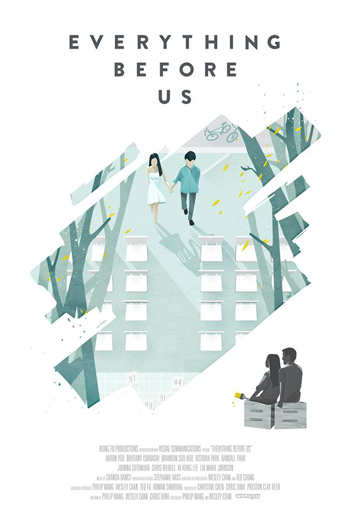 And while the new feature film “Everything Before Us” never spells out the exact parameters for “relationship score,” the film, now available through Vimeo On Demand, the score rewards staying together as half of a couple, for one year or longer. Substantial penalty for early breakups. Substantial penalties for infidelity, lying, cheating generally. No penalty for gaming the system by dating people with higher scores. And what happens in cases of polyamory isn’t spelled out. What happens in case of a significant other turning to violence, and/or telling lies constantly, isn’t spelled out. In fairness, the film, directed by Philip Wang and Wesley Chan, aims for a mainstream audience. The major characters are all Asian American, as is the directors’ production company, Wong Fu Productions; but they live American lives and make broadly American choices. And one of those American choices is to occasionally push all the chips into the middle. The film revolves around two couples, one older, one younger. The two young people, Seth (Brandon Soo Hoo) and Haley (Victoria Park), go proudly down to the D.E.I. (Department Of Emotional Integrity) to register as a couple, because they’re proud and they’re only seeing pink clouds. They’ve been sweethearts through high school, they will be buried under the same headstone, and no one, not even the patient advisor at the D.E.I., can tell them different. Then, life happens to them. The other couple, Ben (Aaron Yoo) and Sara (Brittany Ishibashi) already have history, and tumult, behind them. They’re living through that old saw that people should be forgiven for things they did while young, because anyone young is crazy. Problem is, nobody can agree on the cutoff age for forgiveness, or the cutoff for forgivable crazy. Ben and Sara hurt each other when they were younger, a bit like Seth and Haley will hurt each other as the film unspools. Ben and Sara both admit they made mistakes, but like most people, they hold a little back, and they apportion more blame to the opposite side of the table than to their own. That’s understandable, if not exactly commendable. But in a world where your relationship score determines which school you can get into (and stay in), which job you can get (and keep), which clubs you can patronize, and how the rest of society turns its eyes on you (or away from you)—such decisions carry much more weight. This world has no room for slipping and sliding, but it also has no room for designing and executing your own redemption, no room for bucking its system. Everything works by the numbers. “Everything Before Us” is available for view at vimeo.com/ondemand/everythingbeforeus.